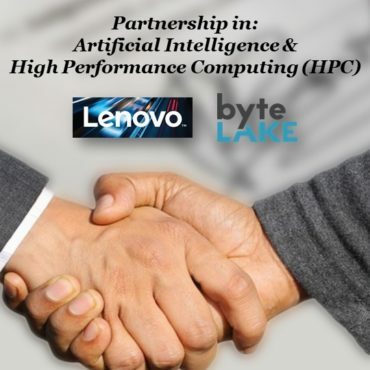 Lenovo includes byteLAKE as their AI & HPC partner alongside with Intel and NVIDIA. “In business, we always bet on great teams and amazing products. Business also loves speed and needs to know where it is heading. Therefore at byteLAKE we have made a decision to focus on AI & HPC and aligned all of our plans and decisions towards that direction. Once you hit the road and start your business journey, you understand that it is not so much about where you land but with whom you land. As strong believers in the power of teamwork, we are proud to announce that our name is now officially placed alongside with giants like Intel & NVIDIA in the context of partnering up with Lenovo for making the world better with Artificial Intelligence“, said Marcin Rojek, byteLAKE’s Co-Founder. “We’re also working with a number of partners on AI initiatives that will provide real world solutions for customers. By combining a diverse set of data science expertise with deep industry knowledge of industry segments including healthcare, life science, energy and manufacturing, we’re able to provide solutions that meet customers where they are. Our (Lenovo’s) collaboration with partners such as Intel, NVIDIA, Mark III systems, and byteLAKE greatly expands the resources and expertise we’re able to provide“, said Dr. Bhushan Desam, Lenovo’s AI Global Business Leader, HPC and AI Business. 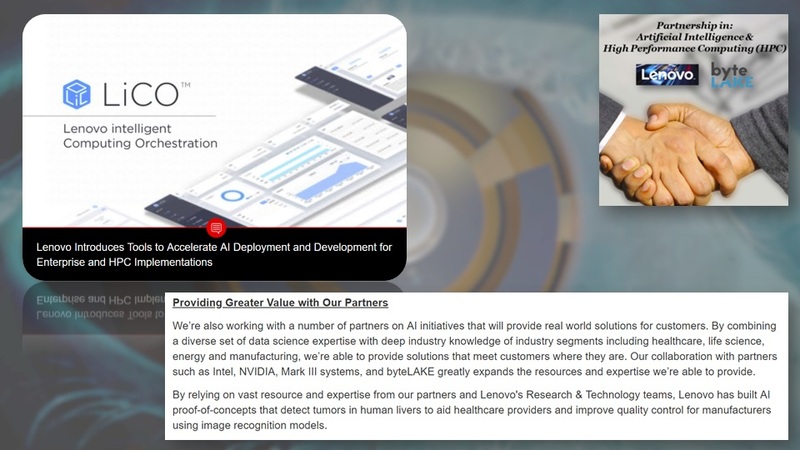 byteLAKE are specialists in Machine and Deep Learning and is a business partner helping enterprises embrace the power of Artificial Intelligence. byteLAKE gives machines the ability to learn and become smart. They transform computers into intelligent machines by enabling them to identify objects, analyze scenes and activities in real-life visual environments. byteLAKE offers intelligent software for all sort of edge devices and has a massive experience in porting, developing and optimizing software for supercomputer platforms (HPC). They help combine data, business objectives and domain expertise with cutting edge AI techniques. Explore Lenovo’s intelligent Computing Orchestration (LiCO) & Lenovo’s AI solutions.